Durdan’s Park Primary and Nursery School is a community school that provides quality education for children aged between 3 and 11 years. We provide a secure and caring environment where children are comfortable and most important of all, happy. We have high expectations of each and every one of our pupils in an educational and social capacity. We know, as educationalists, that children learn best when they are happy and when they have high self esteem. Our team of staff work hard to ensure that the talents and skills of all pupils are recognised. A high level of self-esteem is the key to learning. The school’s Governing Body is a proactive and a positive force for school improvement. In addition, the majority of Governors are parents of children at Durdan’s Park and as stakeholders, their commitment to the school is assured. It is our intention that the school will continue to go from strength to strength, helped by the goodwill, support and commitment of parents. My staff and the Governing Body are always open to new ideas that might lead to school improvement and enhance the quality of the primary school experience of all our pupils. Durdan’s Park Primary School is pleasantly situated, surrounded by trees and fields. King George’s Drive is off Lady Margaret Road, opposite Cornwall Avenue. It is served by bus routes E5, 120, 105 and 195, which stop within five minutes walking distance of the school. The school and its Nursery Unit opened in 1976. The building has conventional classrooms. It is well equipped, with a library containing a large number of books. The library is regularly updated and new books are chosen with due regard to the cultural and ethnic background of our children and the Equal Opportunities Policies, both of the school and the London Borough of Ealing. The school has a suite of 30 Personal Computers plus a scanner and is linked to the Internet. Every classroom, including the Nursery Unit, has a computer with internet access and all classes have an interactive whiteboard for teaching purposes. A specialist Music teacher works with all the children each week using a variety of musical instruments which reflect the background of our children. There is a dedicated Music Room. There are areas in the school for cooking, art and craft and drama. The halls are fitted with gymnastic apparatus and there is an ample supply of physical education equipment. All classrooms have sinks, toilets and a cloakroom situated close by. KS1 bays have additional quiet areas. A welfare room, used for medical care, is situated near the main office. The school takes security very seriously. Access to the school building is controlled by remote-controlled entry gates. Durdan’s Park Primary School is able to accommodate 420 pupils in the main school and an additional 100 pupils in our Nursery. There are 22 teachers and 21 support staff who work closely to provide quality education for pupils. Our annual intake is 60 children excluding Nursery. Nursery and Reception children each have their own play area. The older children share a large playground at the rear of the school. Each team is led by a Team Leader who is responsible for the immediate management of the staff and pupils, and will be the first point of contact for parents of those children. A daily Assembly is held in accordance with the 1989 Education Act. 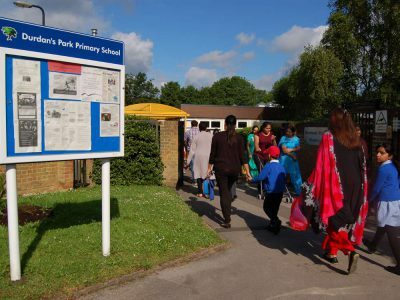 Durdan’s Park Primary School is a multi-ethnic, multi-cultural school. Religion is central to the lives of many pupils and there are a wide range of religions that are practised by the pupils attending our school. Our Assemblies are accessible to all pupils, regardless of religion or belief. In addition we hold assemblies to celebrate Diwali, Eid, Eid-ul-Fitr, Guru Nanak Dev Jis birthday, Harvest and Christmas. We also hold Team Point Assemblies at the end of every term.